Maples trees, beautiful and stately, are versatile shade trees in the home landscape. Usually maintenance- and problem-free, maples planted in lean soils sometimes require fertilization. Pay careful attention to plant symptoms and supplement only when needed. Maple trees, like all plants, grow best when soils contain sufficient amounts of basic nutrients. Nutrient-deficient soils result in poor growth and weak roots and branches. 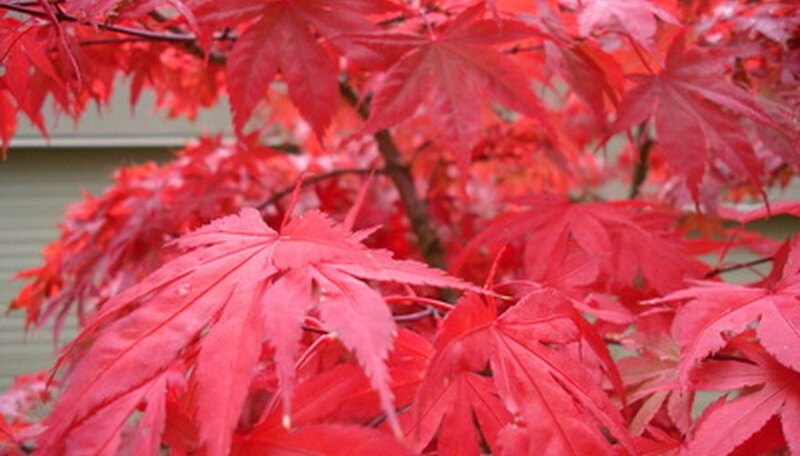 Maples, often planted for their bright foliage, lose their color when malnourished. The primary symptom of poor nourishment in maples is leaf color. Bright green leaves appear washed out, while bright reds and oranges turn a weak hue or turn green. Slow shoot growth (present year’s new growth) is an indication of lean soil. A soil test can confirm nutritional needs. A good rule of thumb is that fertilizers for maples should be high in nitrogen (N), low in phosphorus (P) and moderate in potassium (K). N-P-K ratios, therefore, should be similar to 24-0-15 or 30-0-10. Fertilizers with trace amounts of manganese and other micronutrients are helpful to the overall health of maples. Amend soil at planting if the soil is known to be lean in required elements. Fertilize trees requiring supplementation in spring before they leaf out. Scratch the fertilizer in the soil below the canopy. Fertilizer spikes, specially formulated for various tree groups, make fertilizing easier and release their nutrients gradually. The application of compost and composted manure at planting provides natural fertilization over time. Since maples often like moist soil, large amounts of organic matter give the added benefit of moisture retention. Organic fertilizers release their nutrients slowly. When used as directed, organic fertilizer will not burn roots through overfertilization. A mulch of dried grass clippings is rich in nitrogen and will quickly fortify soils. Every spring, replace organic mulches, which nourish maples as they break down. Maples do not always require annual fertilizer applications. Apply in spring if trees show deficiencies or when a soil test indicates a need. If maples grow where fallen leaves do not need to be raked, leave them in place where they will nourish the soil as they break down. When trees show symptoms of nutritional failure, give careful consideration to soil pH. Maples prefer neutral to slightly acidic soils. Highly alkaline soils block the absorption of iron, nitrogen, manganese and other essential elements. Neutralize alkaline soils with pH above 7.0 by adding aluminum sulphate or iron sulphate. Maintain organic mulches to increase acidity over time.